I usually despise head-to-toe repaints (httr). Thankfully, this new sculpt figure has the arms of Barrel Roll added to the… everything else of the 2005 Rollbar, narrowly escaping the head-to-toe label. But even though I know it’s not an httr, on some level the addition of the different arms just isn’t enough to convince me it’s not. So, for the purposes of this review it is an httr. Even though it’s not. But even if this figure, the 2006 SAW Viper, had been a full-fledged head-to-toe repaint, I would still hold it in high regard. Most httr’s don’t work because they don’t accomplish anything. Roadblock gets repacked as Double Blast. Torpedo becomes Wet-Down. Barbecue somehow passes for Payload. Sometimes it’s a legal issue with a copyright to a name. Perhaps there’s some laziness. Sometimes a mold gets lost. Whatever reasons motivated Hasbro to re-use one mold as another character, it rarely worked. This SAW Viper evaded being typical httr trash because it served a purpose. Hasbro wisely took the SAW Viper concept and brought it closer to being what an actual terrorist organization (with some cash) might create for the uniform of a squad assault weapon operator. It brought the SAW Viper a level of grit missing from the first SAW Viper, even though he managed to butcher some beloved Joe characters in Marvel Comics. In fairness to Hasbro, the almost-an-httr move was pulled off successfully at least one other time, with the 2006 Low Light. But that’s another figure for another day. Unlike the 1990 ARAH version, which featured a bad purple and burgundy uniform complete with chaps and strange ringed boots, NS Saw Viper is very low key. So low key in fact that the character is wearing basic fatigues, which happen to be colored thematically to match Scrap Iron’s 1984 dark blue and dark red color set. The removable helmet doesn’t quite match up with the molded-on helmet of the ARAH SAW Viper, but the neon visor and microphone still convey its signature look. 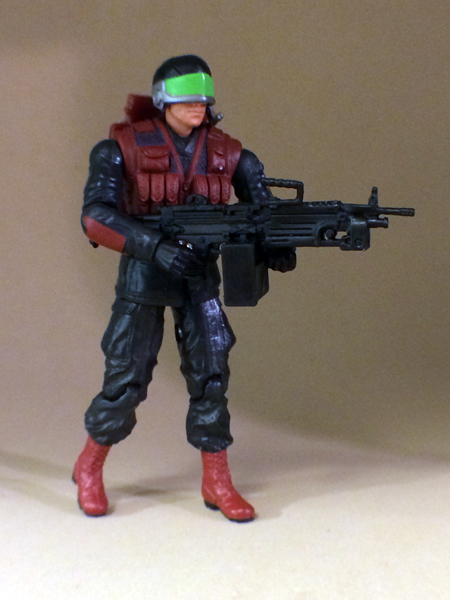 The helmet, the backpack (the same one as the 1990 SAW Viper), and the SAW weapon make this figure immediately recognizable as being a SAW Viper. The weapon included with the NS SAW Viper is based on the real-world M249 light machine gun. It’s a wonderful upgrade over the ARAH SAW Viper’s weapon, which simply had too much going on to not look silly. Rollbar’s head is still there, with its once sandy hair now mud brown. But who would ever take off the amazing helmet? Hasbro could have left the hair and eyes unpainted and I wouldn’t have cared (okay, I would have). The entire vibe of this character is so different than that of Rollbar that using the same head doesn’t really matter one way or another. The Rollbar head does provide a chiseled jaw line that gives the figure a bit of Jason Statham-esque machismo. The helmet obscures the rest of the head so it just doesn’t register as being Rollbar anyway. This figure came very late in the NS era, when proportions had been much improved. Hasbro was also tinkering with some of the upgrades it would fully embrace in the modern era. The Barrel Roll arms gave SAW Viper some of the Joes’ earliest swivel wrists and rivet-less shoulders. But unlike many fancy modern era figures and their wrists, SAW Viper can actually hold its weapon. The fatigues-wearing SAW Viper looks like a much more natural evolution of Cobra’s standard ground troops than the first strange version from 1990. This is a specialty role that should look like it’s only a half step after being a standard Cobra Soldier and half a step sideways from being a Cobra Viper. NS SAW Viper accomplishes this look. Not too bad for an httr. It’s “Double Blast”, not “Double Barrel”. The helmet doesn’t fit the head weil…look at the mike hitting the shoulder. The shirt tails. Ah, they look nice but he’s got trouble sitting.. GI JOE is a vehicle intensive line, being able to sit is not optional. It was odd they made Rollbar like that to begin with. The “skirt” material cannot be soft enough to ever make it work. Still, probably the best looking SAW-Viper made…if that’s saying anything…since the others are purple and pink wackiness. Could be wrong here, but I think that the term “assault weapon” is specific to legislation regulating the civilian ownership of certain types of firearms (and media talking heads getting the vapours, but that’s another story…); the actual military designation of the M249 is Squad *Automatic* Weapon (which also makes “SAW weapon” a bit redundant).